Als AGA-Flipper ist derzeit "Slamtilt" erste Wahl, doch Wizards mit einem A500, A600 oder A2000 kugeln hier richtig: Der jüngst für den 1200er getestete Erstling von Effigy hat erfolgreich auf ECS-Format abgespeckt! Optisch unterscheiden sich die drei hiesigen Tische kaum von ihren Aga-Cousins, nur im direkten Vergleich erkennt man beispielsweise die weniger bunten Score-einblendungen. Sonst blieb fast alles beim alten: Die Murmeln rollen über liebevoll animierte, überhohe und extrabreite Spielfelder, die wie von der Tarantel gestochen nach oben und unten sowie etwas nach links und rechts scrollen. Sogar der Multiball-Modus blieb inklusive der automatischen oder manuellen Umschaltoption auf die übersichtliche Hires-Optik erhalten, was einer Premiere gleichkommt - einen scrollenden Flipper mit bis zu zehn gleichzeitig aktiven Kugeln hat auf den Oldie-Amiga ja bisher noch kein Mensch zu Gesicht bekommen! Der Preis der Innovation ist ein gelegentlich etwas störendes Ruckeln der Bälle bei fehlender Turbopower unter der Habe, woran die neu aufgenommene Verklenerungsmöglichkeit des Sichtfensters wenig ändert. Dafür werden die Lauscher mit überzeugenden Sound-FX sowie zur jeweiligen Spielsituation passenden Fantasy-, Trance- und Technoklängen verwöhnt. Das Gameplay orientiert sich freilich weiterhin nicht sklavish an realen Kugeleien, sondern schöpft die Vorteile des Rechners durch gute Einfälle aus: Begrenzt haltbare Flummikugeln oder Wanderziele wird man in der vorliegende Version in Kneipen wohl vergeblich suchen. Thematisch ist eine "epochale" Reise angesagt, die am schlichten Steinzeit-Tisch beginnt Hier prügelt man die Kugel mit vier Keulen durch den Dschungel und einen Wasserfall, trifft dabei einen Triceratops, entzündet Fackeln und zielt auf wegklappende Bonusfelsen. Die Gegenwart beinhaltet dann schon mehr Rampen, Kugelfallen, Bumper und Bonusziele sowie eine zweite Spielebene mit einem Fußballfeld und einer Antennenschlüssel als Ballweiche. Optisch besonders ergiebig ist de Flipper aus de Zukunft, wo fünf Laserschwerter als Paddles, ein Kugel-Roulette, eine Zwei-Wege-Weiche und viele andere lohnenswerte Ziele warten. Hier wie da erlaubt die sehr effiziente Rüttelfunktion eine gezielte Beeinflussung der (icht immer realistischen) Rollbahn, und der variable Schwierigkeitsgrad entscheidet darüber, welche Ausgänge offen sind, welche Ziele man wie häufig für welche Punktgutschrift treffen muß oder ob Boni nach einem Kugelverlust getilgt werden. Over the last few months I have reviewed two or three pinball games and to be honest none of them have managed to sustain my interest at all - although I did give Thomas the Tank Engine's Pinball a good 90% or something, mainly because a) it was for kids and b) I thought the novelty effect was good. I'm not particularly a lover of pinball as I've mentioned countless times before. However, something different happened when I loaded Pinball Prelude - either I wasn't fully conscious from the night before or I'd actually found a pinball game which, believe it or not, I actually liked. There are three tables - which is less than the other games - and tey're all based around a certain theme, which is basically the whole concept of time. 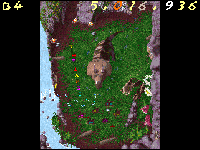 The 'Past' level features a prehistoric landscape with a huge dinosaur planted right in the middle. There are rock faces, dinosaur footprints, skulls and all things prehistoric. Instead of the boring flippers you get on everyday pinball tables, these are actually the cro-magnon man's clubs. Not golf clubs, you know, big wooden things. 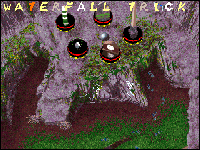 Along with all these presentational features there are many additional ones which make the game more interesting such as bonuses and extra balls, waterfall rides, rubberball, splat-the-rat, bonfires and the Dino ball gobbler. Make of them what you will. The second table follows the 'time' theme and features the present day. Yep, all the advanced technology appears - mobile phones, computers, football. This is actually my favourite table because when you bang the ball up to the top of the screen the ball will enter a small football stadium. On the pitch are three static players and the ball will bounce around the pitch until it ends up in one of the goals, keeping going until the final whistle. The score for your team will reflect on your points total. There are loads of other bonuses like trying to park your car in a full car park, rolling the ball round a satellite dish, camcorders, and dialing numbers on a mobile phone. There really are too many to mention,and they will all take a bit of finding as well - I played it for about half an hour and only found two or three. The third and final table is, of course, the future but it's more like a Star Wars table with graphics such as the carbonite chamber and Luke's green light saber for flippers. Instead of the ball being sprung into play from the right as usual, it sits on the spring in the middle of the screen. This table also features all the multiballs, bonus balls, targets and other strange extras, but somehow I don't feel this comes close to the Past and Present tables. 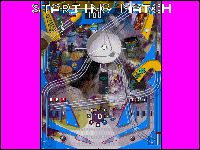 Overall Pinball Prelude is a game that features outstanding graphics and superb sound effects. It's a pity there are only three tables, but with data disks coming in the near future, this could well turn out to be one of the best pinball simulators money can buy. 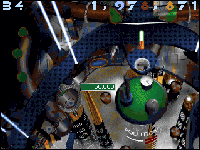 New team of coders, Effigy, get right back to basics with this addictive pinball escapade. Playability is king at Effigy's towers and looks, as I often remind Nick Veitch, aren't everything. If, like me, you found the much-hyped Pinball Dreams, Fantasies and Mania good-looking, but ultimately drab, you'll love Prelude - it's the exact opposite in that it plays like a dream, but unfortunately looks less than glitzy. So, you've got three tables - Past, Present and Future - but really you've only got two, because this otherwise top game loses the plot completely with the Future table, which is poorer than a very poor thing. In fact, if this is what the future is really like, I'm staying put. Let's take a look at each of those tables, shall we? The Past is ages ago. Not yesterday or the last century, but back in some prehistoric time riddled with dinosaurs and, strangely, rabbits and rats. Allegedly, you can complete this table by transporting things to the correct time zone. I couldn't, although Veitch claims to have had some success while he was idling away a few hours, but I had immense fun trying and, ahem, got two scores on the all-time top five for my troubles. This is the best of the three tables. It's all very straightforward; there are a few neat, yet simple touches, like the side lane waterfall, but it's difficult. Take, for example, the bonus multiplier which involves slinging the ball into the dinosaur jaws on the right of the table. The best way to do this is as a backhand off the right flipper. The shot is a tricky little blighter, but once mastered, completing it is almost as satisfying as scoring at the far post with a diving header at Sensi. Actually, I can only presume this to be the case because, despite devoting a fair part of my adult life to executing such a goal, I have yet to achieve it. Other neat features include the multiball (achieved by completing a series of hellishly difficult shots past the top-left flipper) splatting the rat when the little fella pokes his head up, and the rubber ball. The whole thing is fast, yet simple, and extremely addictive. Prelude is the exact opposite in that it plays like a dream, but looks less than glitzy. The Present is the most complicated of the tables with loads of ramps, shoots and flashy things, including a mini football game, a curious car parking facility and a rather fetching Smiley ball feature. Like the Past, it's fairly easy keeping the ball in play, but hitting the scoring shots takes some application and involves the full repertoire of backhands, switching the ball across the flippers and, of course, luck. The shot up the ramp to the big circular thing in the middle that gets you your multi-ball and the Smiley ball is particularly tricky. Took me ages to get it right and, naturally, I couldn't do it again when the time came to do the grabs. The mini football bit is excellent in a bizarre and pleasingly pointless kind of way. The Present is a good place to be. The Future table is the table that lets the whole show down. Stop Press: Due to Effigy operating through mail order, they released it in an unfinished state with the promise of an upgrade as and when it was finished. We'll get Rich to look at it again next month. Hurrah for Effigy. If it wasn't for the dreadful Future table, Prelude would have got a Format Gold. But let's concentrate on the good things. After a glut of games that tried to emulate pinball tables, we now have one that involves a bit of lateral thinking. It takes the basic premise of hitting a ball with flippers to create a game that requires skill and reactions and has a fairly steep learning curve. It doesn't matter whether it's a pinball game, a footie game, a beat-'em-up, or a flight sim, but any game that has those qualities is going to be addictive and, let's face it people, it's good to get hooked. So, do it! Hardly luxurious, but kinda fetching. Cartoon-like sounds conducive to the action. Top-quality hook factor. You'll be gagging for more flipper action. Plays like a dreaml Simple but alarmingly effective. The third table is awful, but Past and PResent are two of the best pinball adventures on the Amiga. It's only that third table that prevents Prelude from striking Gold. Let's hope the new upgrade has picked up on this. 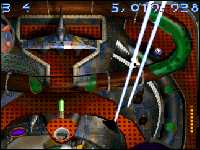 Pinball Prelude is the silverball affair we reviewed last issue and suggested that it could be the finest thing with flippers ever seen on the Amiga. But we stopped short of awarding it a Format Gold because the third table, The Future, was crap. In fact, it transpired that The Future wasn't finished - we've been there so we know. But now it is. And here's what it's like. The Future bears only a passing resemblance to the half-finished version we saw last month. Unlike the other two tables, The Past and The Present, it's a 3D game, but like the others it relies on imaginative gameplay and tricky shots for its charm, rather than glitzy graphics and flashy things. It's the most difficult of the three tables. Whereas you were almost certain to get a multiball sooner or later on the other tables, this one requires stealthily laid plans and finely executed shots. Damn! What you really want is a multiball - and that's the tricky part of the equation. The Future is fast. There's one particular shot when you ping the ball round the right-hand tube that returns it at the speed of light, or faster. In these circumstances it's best to leave the flippers down and hope for a lucky bounce. Valiant attempts to thwack the ball back up the table at twice the speed only result in humiliation and the loss of a droid (as balls are known in The Future). But keeping the ball in play isn't really the challenge of this table. What you want is multiballs, and that's the tricky part. You see, it's not entirely clear how to get them - the on-screen prompts tell you what to do, but fail to suggest how you might achieve it. For example, after you've lit the eye (hit the ball round the right tube a given number of times - tricky shot) you are implored to Loop The Cleaner. Given the absence of domestic servants among The Future features, it's a matter of trial and error to determine that "The Cleaner" is the tube thing on the left of the table. It's also not entirely clear how the mini-table feature on the right side works, but, hell, it's fun anyway. Reviewing The Future in isolation perhaps doesn't give a fair overall impression of the quality of Pinball Prelude. Because The Future works in different ways and requires different skills to The Past and Present tables, it makes Pinball Prelude a fantastic varied game. Not so much a pinball simulation (who needs 'em) but a top game with flippers and balls. 3D and futuristic, but not the game's strongest point. Futuristic bangs, clangs and whizzes. And the occasional siren. Like the other two tables it'll hook you. More difficult than the other tables, but just as playable. If this table had been on the original mail order version, Pinball Prelude would have got a Format Gold. So it seems only fair to give it one. Um im Wettmurmeln gegen "Pinball Illusions", "Obsession" und andere Genregrößen bestehen zu können, muß eine neue Flippersim schon einiges auf dem Kasten haben. Doch wenn sie so originell ist wie dieses Erstlingswerk von Effigy, dann ist das bereits die halbe Miete! Keine Frage, in der exklusiv für AGA-Wizards konzipierten Kugelei steckt ein ganzer Sack voller guter und noch unverbrauchter Ideen: Erstmals im Genre sind die am Screen traditionell überhohen Tische zusätzlich auch extrabreit, sie scrollen also nicht bloß nach oben und unten, sondern auch ein gutes Stück nach links und rechts. Und das schaftt logischerweise Spielraum für mehr lohnenswerte Ziele. Außerdem brechen die Programmierer mit der bislang als unabänderlich geltenden Angewohnheit, stets das Verhalten realer Arcadeflipper nachahmen zu wollen. Dadurch finden sich bei Pinball Prelude nun allerlei Attraktionen, die es eben nur am Computer geben kann - wer hätte in der Kneipe schon mal bis zu zehn Multibälle gleichzeitig gesehen? Auch eine Replay-Funktion zum nochmaligen Betrachten besonders gelungener Ball-wechsel, den begrenzt haltbaren Turboflummi oder Wander-Targets, wie sie hier gelegentlich die Rollbahn kreuzen, trifft man dort natürlich nie. Daß es bei Pinball Prelude nicht gar so bierernst wie bei vielen Kollegen im Genre zugeht, zeigt sich freilich auch an den drei (namenlosen) Tischen selbst. Als thematisch originelle Grundlage dienen ihnen die drei wichtigsten Zeitepochen in der Geschichte der Menschheit: Der schlichteste Flipper siedelt in der Prähistorie, wo die Silberkugel von insgesamt vier Keulen über das Spielfeld geprügelt wird. Dort trifft sie auf einen Dino, rutcht einen Wasserfall hinunter, entzündet Fackeln oder haut Bonusfelsen um. In der Gegenwart warten dann einige Rampen, Kugelfallen, Bumper und Sonderziele sowie eine zweite Spielebene mit einem Fußballfeld und einer Antennenschüssel, wo mehrere Ausgänge sozusagen als Ballweiche fungieren. Als optisch besonders üppig erweist sich aber die Zukunft, wo der Ball mit Hilfe von fünf Laserschwertern in Richtung eines Kugel-Roulettes, einer Zwei-Wege-Weiche und vieler anderer lohnenswerter Targets zu dirigieren ist. Sehr praktisch ist dabei die etwas wirklichtkeitsferne, dafür aber höchst effektive Rüttelfunktion, denn sie erlaubt es, den Kurs der Murmel wirklich heftig nach links oder rechts zu beeinflussen. Als weiteres Novum findet sich hier ein regelbarer Schwierigkeitsgrad, der bestimmt, wie oft ein Ziel für welche Punktgutschrift getroffen werden muß, welcher Ausgang zum Verlust einer der vier Startkugeln führen kann und ob nach dem Tilt bereits erzielte Boni erhalten bleiben. Zumindest außergewöhnlich sind auch die sehr flexiblen Einstellmöglichkeiten zur Darstellung am Screen. Im Angebot befindet sich die übliche LoRes-Optik inklusive rasantem Scrolling, sowie das verhältnismäßig geruhsame, weil nahezu statische HiRes-Vollbild in drei verschiedenen Grafik-Auflösungen. Auf Wunsch wird automatisch zwischen den jeweils bevorzugten Modi umgeschaltet, sobald die Multibälle in Aktion treten. Apropos: Wenn wirklich mal zehn Schusser gleichzeitig über die schiefe Ebene rollen, kann nur eine Turbokarte im Rechner ihren ruckelfreien Lauf garantieren. Aber das ist verständlich; wünschenswert wären höchstens noch zusätzlischer Antiflimmer-Grafikmodi bei Vorhandensein eines geeigneten Multiscan-Monitors gewesen. Doch vielleicht hat man sich das für die bereits angekündigten Datadisks aufgespart. Die grafische Präsentation an sich läßt sich nämlich kaum besser lösen als bereits getan. So scrollen bei Pinball Prelude viele bunte Farben und etliche liebevolle Animationen seidenweich am Auge des Betrachters vorbei. Die rotierenden Kugeltore sehen beispielsweise fast schon echter aus als das Leben selbst, dafür laufen an anderer Stelle mitten auf dem Table kleine Videos in einem Minifenster ab. Für den Spielablauf selbst mag dieses Gimmick ja ohne Bedeutung sein, aber man freut sich doch, mit wieviel Begeisterung die Programmierer hier ganz offensichtlich am Werk waren. Nicht weniger überzeugend ist die akustische Untermalung geraten, denn die Sound-Effekte sind ebenso gut gelungen wie die je nach Tisch und Spielsituation unterschiedlich dramatischen Fantasy-, Trance- und Technoklänge. Wenn man bei diesem beeindruckenden Erstlingswerk also unbedingt etwas beanstanden möchte, dann vielleicht das im Einzelfall leicht unrealistische Abprallverhalten der Kugeln oder die fehlende HD-Installation. Gerade für den letzten Kritikpunkt muß man aber schon ein arger Kleingeist sein, da nach dem Start ohnehin keine Nachladepausen mehr den Spielfluß stören. So when do we get the main bit then? Few things fill my heart with such joy as pinball. Truly it is a noble sport with its flashing lights, glamorous tables, hot ballistic action and friendly multi-playerness. An evening in a public house with a few pints of ("Creaming Soda" - Ed), some stirring tunes on the jukebox and a collection of close friends is greatly improved by the introduction of a pinball table. Small rivalries will surely ensue, a wager or two may be made and the grey ugliness of winter will stay safely locked outside. Should you live as I do in a first-floor flat with a narrow rickety staircase, and, indeed, a burning van parked in the street, then a game of pinball during a quiet evening at home, perhaps, after watching an intriguing documentary about elephants, is regrettably precluded. Thank heavens, then, for the trusty (if slightly battered these days) Amiga and its pantheon of pinball simulations. Of which this is another one. Pinball Prelude is not quite like the majority of pinball games. There are things on its three tables (imaginatively named Past, Present and Future) that you would not see on real ones, innovations such as oddly-shaped flippers, impractically expensive sub-game, irregularly-shaped bumpers and an action replay. There's also a welter of lovely graphical details. The ball sinks into the water when riding the waterfall on the Past table, the misleadingly-named elastic ball (it's rubber) from the Present moves at such an alarmingly realistic pace you are forced to concentrate manically, and as a reward for hitting certain targets and loops, the droid ball on the Future table turns into a hideously disturbing blinking eyeball. Fantastic atmosphere is not lacking Pinball Prelude, and I can say that the Future table is unlike any I have ever seen. The ball moves smoothly and realistically, the loops are varied and rewardingly difficult and you need to master little nudges of the flipper to access some areas of the table, but these aren't the important thing. The important things are the imagination, and the fun. It's a game that's been designed with courage and wit. Examine the traditional AP table descriptions for details, but note specially the sense of adventure pervading the whole game. The instructions are terrible, which is a blessing. You have to learn a table by watching it and by saying "Oh, I see, when you shoot that loop 10 times you get to do this..."
Each table has lots of unexpected bonuses and encourages you to play to see what happens next. There's a Splat the Rat game on the Past table, for example, but also a multi-rat Rat Attack bonus beyond that. It's the joy of discovery that fuels Pinball Prelude. The game is clearly well-playtested. There are options for all sorts of exotic pseudo-hi-res screens (you get to see almost the whole table at once, but it's a mite squished and bitty) and you can alter the number of multiball balls from three up to the absolute riot of ten. (This does mean significant slowdown, but doesn't actually depreciate your enjoyment by much, especially if you're playing with ten rubber balls or smiley faces). It'll even politely switch to-hi-res for the multi-ball automatically and back again afterwards. Is there are downside to Pinball Prelude, it's that you can't shake the feeling sometimes that ideas haven't been followed through. The imagination and originality is highly impressive (they've gone for a genuine computer pinball game, rather than a computer game of pinball) but occasionally the game's clever when it should be fun. Finishing the Past table, for example. Shouldn't it really have led to the next one, rather than ending your game (albeit with a handsome bonus)? And while the table-football game in the Present is ingenious, wouldn't it be better if you could control the little men with the flippers (or something)? More could have been made of the features of the first two tables. (It can't be good when you manage to activate a special bonus and find yourself thinking, "Great, but what they should have done was this...") They're both sound and well-designed, but the appeal of playing does begin to wear off a little too quickly - there are instances when you're not getting to see the interesting stuff because you're locked intro trying to get to see the interesting stuff. Some extra 'quick two-ball multiball' type things would have been good. Still. A cracking pinball game. The first of the three tables, Past is also the simplest. Combinations of loops, ramps and tricks will light the TIMELAPSE letters one at a time. WHen you've done this, you're ready to open the exit portal behind the dinosaur's tail and pop your balls through it. Rather disappointingly this removes them from play, although you do get a bundle of points for doing it. The Past is probably the most ordinary of the three tables, although the club-shaped flippers do make your life more interesting. And there are some excellent features such as the rubber balls. But then you know all this. You've played the coverdisk demo, haven't you? Right, I'll shut up then. "Modern is rubbish" claimed Blur, and although Present isn't rubbish, it is my least favourite table. The best thing about it is the football pitch at the top left. Get a match started and there are a couple of ways of getting the ball in there where it will bounce around until someone scores a goal. Hit targets to choose a side, and if yours wins you get a big bonus. (But when your team goes ahead it's tempting just to hang on to the ball until the clock runs down). The rest of it is mobile phones, fast food, camcorders, smileys and television. And in real life too. Far and away my favourite, and an exemplary lession to anybody who wants to design a computer pinball game. With a hearty disrespect for the conventions of real tables, Future has droids instead of balls, lightsabres for flippers, a vertical flipper and clones instead of extra balls. The design is very atmospheric with murky, pollution-ridden areas, iris hatches that your droid falls through and what looks like an abstract junk sculpture park instead of the ordinary mushrooms. With the droids launched from the central pyramid between your two flippers, it certainly feels different. And yet it is pinball, and your trusty, well-honed arcade skills will not desert you here. Not even when you have ten droids flying about. This is also the most integrated of the tables, with every area being linked to success in others so that you must visit the whole table to score well. Excellent. UPPERS Original and clever design makes these tables intriguing enough to stand plenty of replaying. They look good and they play well. DOWNERS Sometimes you wish they'd sacrificed a bit of cleverness for a bit more playability. We'll let you know the instant we get a copy. Or you could play the coverdisk demo. Apparently, the two versions are exactly the same except graphically. What about Star Trek Next Generation? What about Judge Dredd? Where are my fave pub pinball tables then, eh Effigy? Phew! The whole world stood back and gasped when Alternative Software released Thomas The Tank Engine's Pinball a couple of months ago. At last someone other than 21st Century had caught on to the idea that pinball was big business. Even if a kid's cartoon train was a bit naff as a pinball subject and between it and Pinball Mania you were not exactly spoiled with quality. Effigy seem set to change this trend with Pinball Prelude. I am not sure whether I like the idea or not but as well as the three tables included in Prelude you will apparently be able to buy more on an individual disk basis. According to Effigy if they achieve 2,000 sales they will be able to release a new data disk. 5,000 and a new game will be released. I guess what I dislike about this marketing approach is that even for £19.99 I would have liked four or More tables. The three supplied are good but you cannot help feeling cheated when you open the box and they are already selling more. But I will admit that the idea gets around the lack of availability of pinball games and as long as the quality of the tables keeps up then, well, what the hell. The three tables supplied in Pinball Prelude are themed around the past, the present and the future. The past and future are almost unrecognisable as conventional pinball tables. I mean come on, have you ever played pinball with four caveman clubs or five light sabres? But they are fun. They 'Prehistoric' one is a simple affair but easily one of the most scenic tables I have ever played. It is like taking a stroll through Jurassic Park. Although pinball purists won't be excited by the gameplay, the combination of humour, top class music and SFX and novelty value will not really disappoint anyone. Instead of loops, alleys and bells, it contains grunting dinsaurs (a T-Rex skull and a Tricerops) a river and a series of symbols on a grassy knoll indicating passing time, spinning vortexes and inventions. Congrats, Effigy, on making a break with tradition and succeeding. The 'Future' table is even more bizarre, with a top-down view of a Blade Runner-esque rendered city and what is described as a ball droid which looks a bit like a coloured marble. The best bit are the flippers: they are green light sabres! Smart. The SFX used mean that whenever you move a flipper it makes a pretty genuine Star Wars light sabre sound. Despite these innovations it is the least enjoyable of the three tables. The 'Present' table is much better. It looks like a current pinball table, which means you are on familiar ground immediately. It is themed around communications with a satellite dish, a TV remote control (or is it a mobile phone? ), what looks vaguely like a laptop computer and a football match. One of the really nice touches included is that when the ball enters the football match section it actually changes temporarily into a football. Otherwise the ball does not look very convincing. The music and sound effects are without doubt the best in any pinball game. If you buy it, do yourself a favour and plug it into a stereo because you won't regret it. You can individually change the volume of the music and sound effects, getting the right balance for your tastes and there is also a switchable filter which smooths out the sound and cuts out some of the higher frequencies. It is not easy to score highly in Prelude. Unlike, say, Illusions, where you can blast away almost aimlessly and still chance upon 20,000,000, in Prelude you need to work the combos and pick up multiballs to really get results. There are three difficulty levels. I was highly impressed with Pinball Prelude. Each table comes on a single, separately laoding self contained disk so there is no swopping between games etc. The quality of the graphics is very good and the amount of original lateral thinking used on the various tables is admirable. In the final analysis I found that the table lacked really long term excitement (especially 'Future') and the sort of edge that a genuine pub pinball table provides, but do not let this put you off. It is much better than Thomas The Tank Engine's Pinball and knocks the socks off past masters 21st Century's Pinball Mania. And when you beat the master, the world is at your feet. Or something. 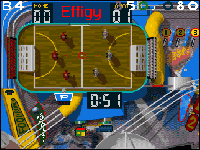 If you've read the feature on page 20 you know by now that Effigy are breaking new ground for Amiga games. Faced with dwindling sales and lack of retail support they've decided to release games on dual format CDs. Pinball Prelude is their maiden voyage into this new avenue of gaming. It will play on a PC CD-ROM, Amiga CD-ROM and even CD32. So, is it any different from the original original floppy version of Pinball Prelude that was released some time back? No. But that's not a disaster because Pinball Prelude is a pretty good pinball game. Effigy went to town creating three interesting tables based on the themes of past, present and future. For example, in the Prehistoric table you've got cavemen clubs as your flippers, together with all sorts of prehistoric items littered about as bonuses such as dinosaurs, time travel clocks, bonfires and such forth. The Present table is a bit more like a standard pinball table. Things like a mobile phone and a footy match feature here while the Future table is a bit more atmospheric. This is a Bladerunner type caper with light phasers as your flippers. All the usual pinball jiggery pokery such as multi-ball bonuses, tunnels and the like are included along with bonuses specific to each table. I really enjoy this game. Control from the keyboard is very responsive and realistic, just as if you were playing on a real table. The CD32 control pad however, was a bit trickier. I kept getting tilted off the table. The graphics are slick and the sound is enjoyable too. And if you manage to do well I'm told there's a chance to win a cash prize. I'm pleased to see this type of format emerging. I hope more companies follow suit.